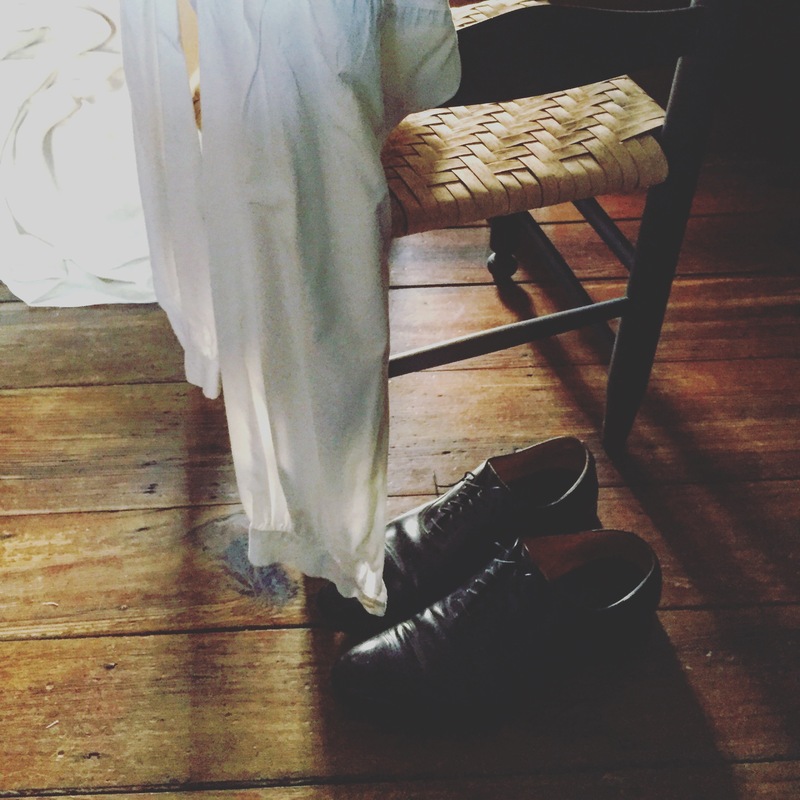 NOTE: This is part of a long-term series of “One Night Stand” ™ blog posts that will document overnight stays in actual historic house museums. I want to understand these sites as more than merely decorative arts galleries – I am interested in them as places of habitation, not museums. I want to thank Gadsby’s Tavern Museum and the city of Alexandria for their willingness to be a part of this experiment. I got the email less than 24 hours before I was to travel to Alexandria, Virginia. The organizer of the gathering for which I was to speak, informed me that the Mayor of Washington D.C. just made an announcement that the city was performing emergency repairs to the subway system and the entire D.C. Metrorail would be closed down at midnight that day. 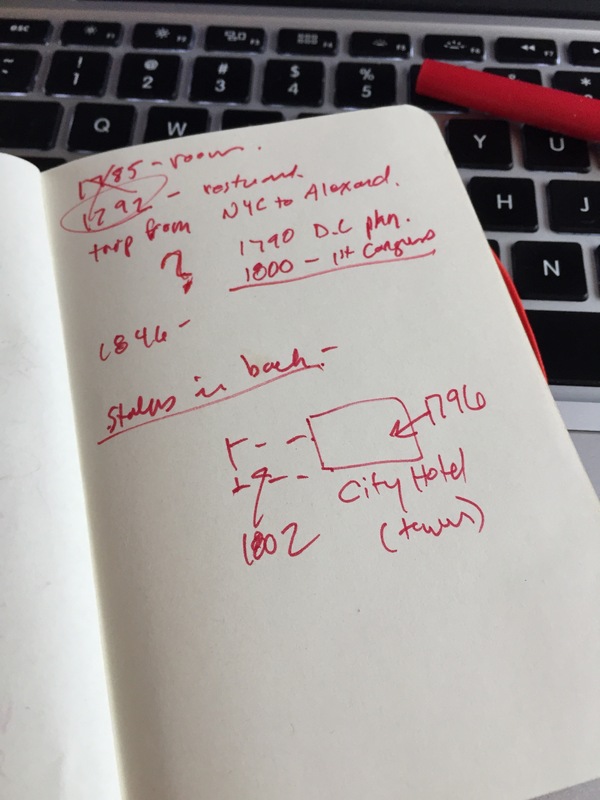 The expectation was, of course, that automobile and bus traffic would be a nightmare, and that I needed to make sure that I gave a lot of time to get from New York City to Alexandria (through Washington D.C.). My plan was to arrive at the D.C. Union Station and then hop on the Metro to Alexandria – easy peasy – except not today. 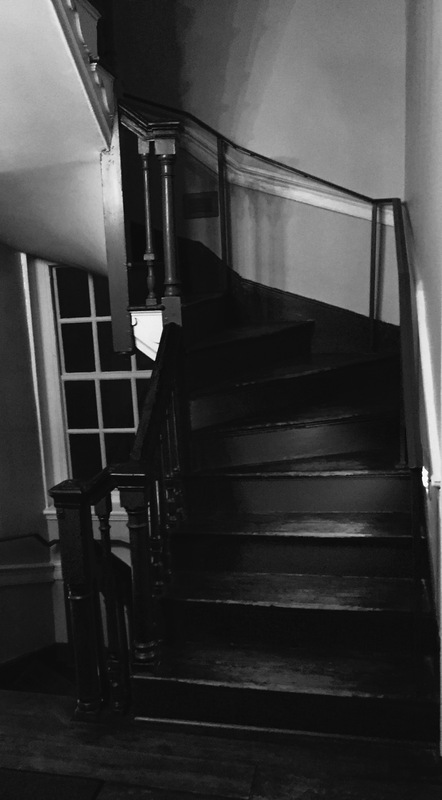 A day earlier, knowing that I was traveling to Alexandria, I was contacted via Twitter by the staff at Gadsby’s Tavern and, as part of my ongoing “One Night Stand” blog series, offered an evening’s rest in their historic lodging, third floor dormer rooms following my presentation. I was delighted to be asked, and I accepted. Excited about not only my presentation, but also my “One Night Stand” at Gadsby’s Tavern and Lodging, I hastily switched my travel plans (and increased the cost from $15 to $130) to arrive directly in the Alexandria train station and bypass the need for vehicular travel within D.C. itself. The train would take about 4.5 HOURS. 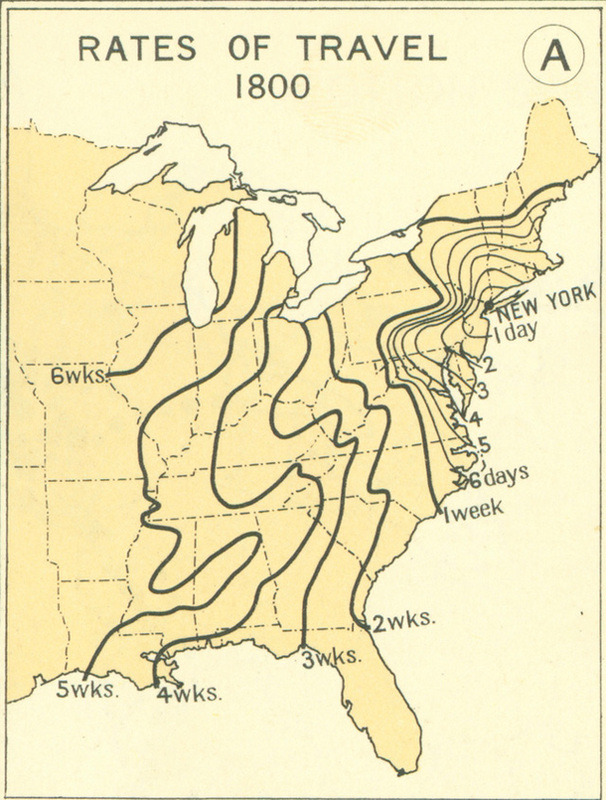 I wondered how long it would take in 1790-1800 to travel from NYC to Alexandria? I pulled out my handy smart phone and found out that it took about 4.5 DAYS to travel the same distance. Same number, but a different scale. I also imagined the level of anxiety and thought that must have been needed to make such an extended journey. The train travel was fine. It allowed me the quiet time to sit back and view the passing landscape. 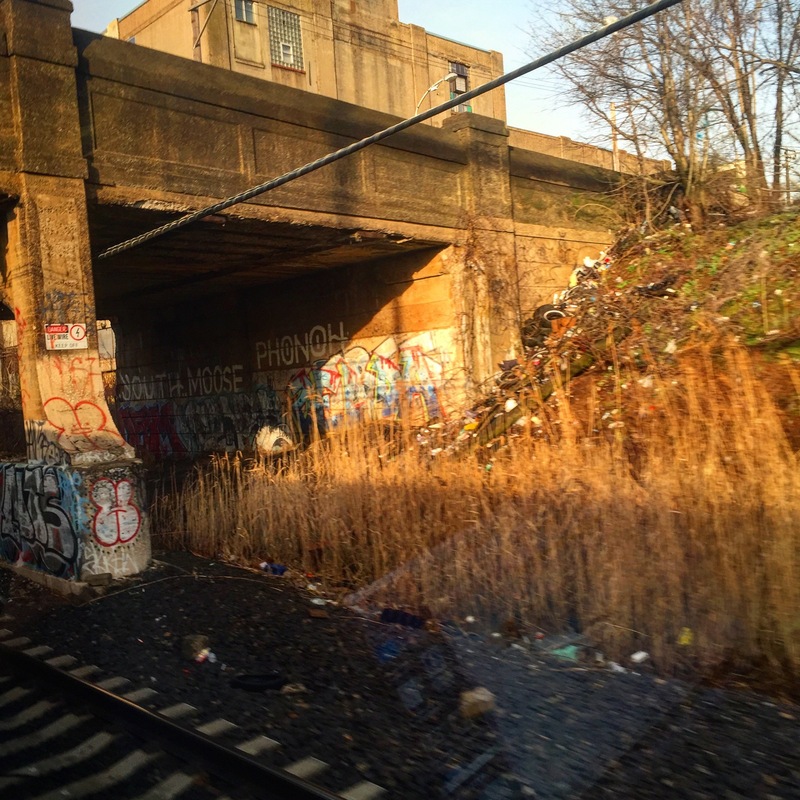 I love the decayed, industrial ruins of the properties directly fronting the Northeast train track line. There is a visual clarity and honesty about these landscapes. When I got near Philadelphia, I began to see a wonderful contemporary overlap on top of the existing aged warehouses and industrial buildings. Bright pink and orange paint was sprayed on these witnesses to our past – as if to re-make them. I was happy others found these landscape worthy of interpretive re-assessment. 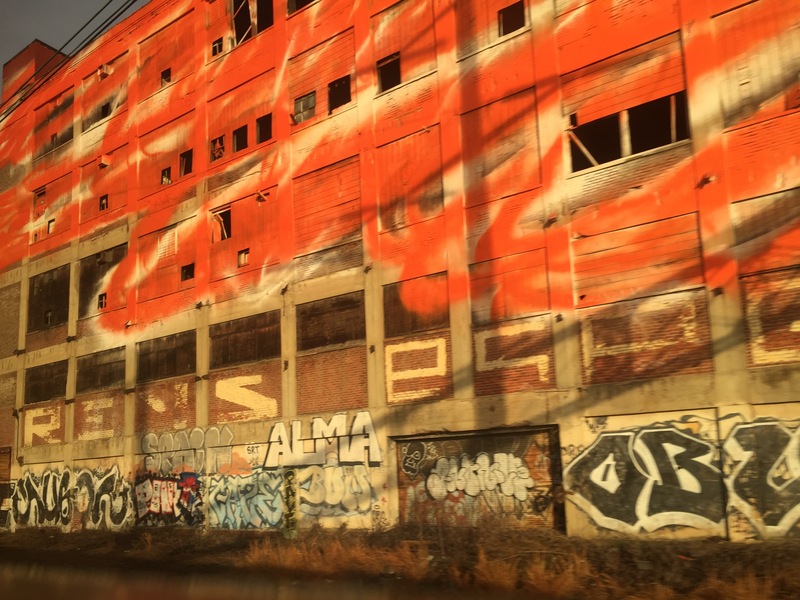 These public art/history projects were executed by the artist Katharina Grosse and facilitated by the Mural Arts Advocates. I imagined what types of things travelers in 1790 would have encountered as they made the journey to Alexandria, VA.? Did the landscape, as in these contemporary public art projects outside of Philadelphia, hold local uniqueness that signified a threshold or boundary between one location to another? Did the landscape and the built environment provide an ephemeral political or social demarcation that was manageable and clear? Or was it fuzzy? 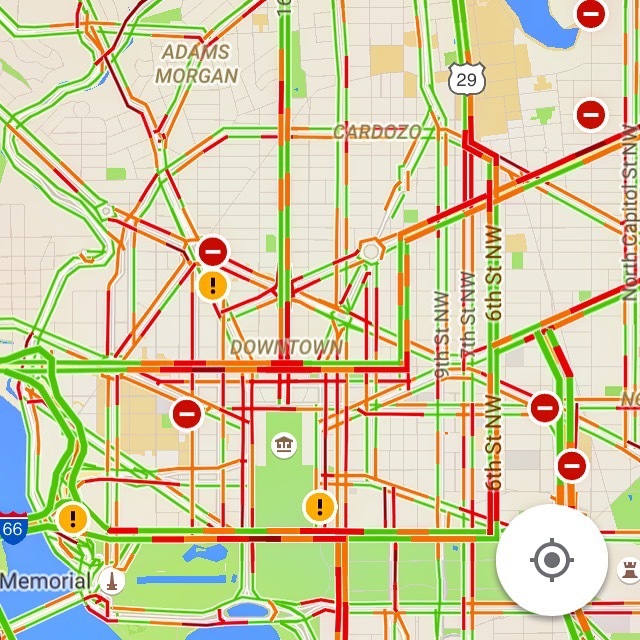 Once we ent ered the D.C metro area I logged onto my social media news outlets to see how the traffic situation was resolving itself. I checked out the Google traffic map and I was verified in my quick travel methodology switch. There was a lot of red on that map. I wouldn’t have made my required arrival time. 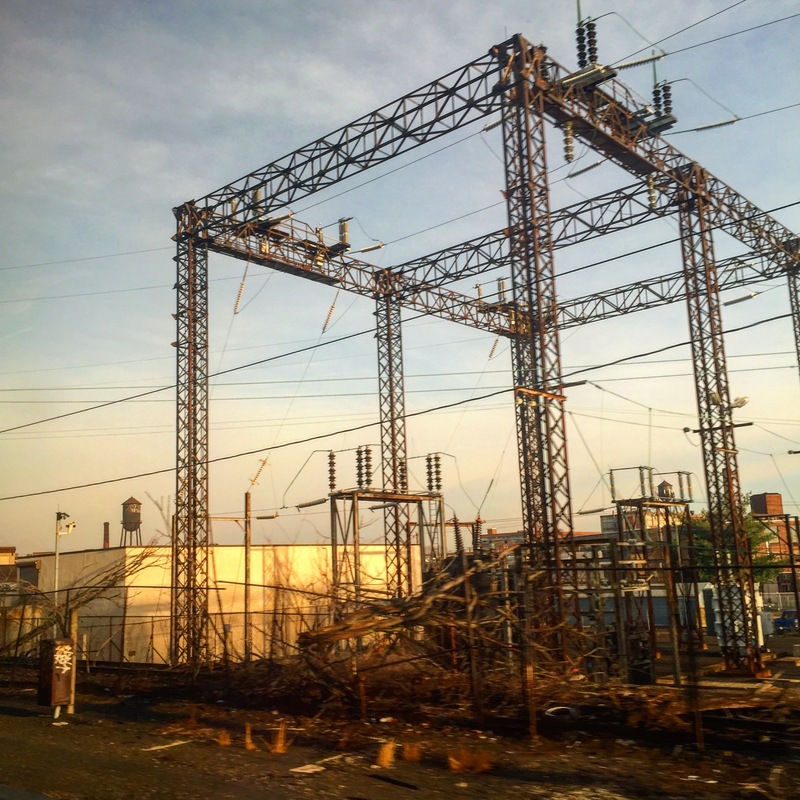 After leaving the train in Alexandria, and as I crossed under the train tracks, something happened to the built environment – my 4.5 hours of decaying industrial landscape changed. 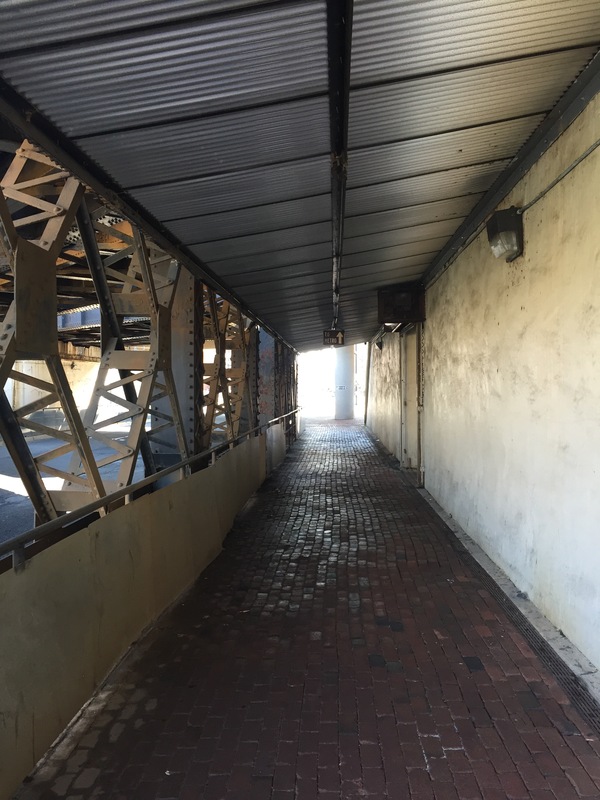 Concrete disappeared, building maintenance increased, and things got “colonial-ly”. The most dominant landmark was, of course, that weird and highly visible masonic monument to old George Washington himself. 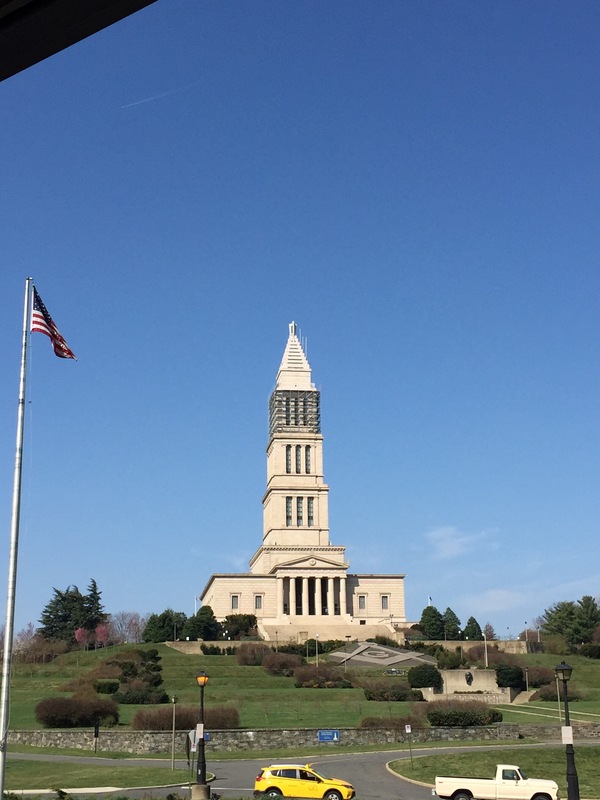 As a history nerd, I have always wondered about this phallic pile of stone, but because the Masons are a secret society – it was secret – and nobody was going to tell someone like me any secrets. Oh well. Beside the “Emerald City of Oz” Masonic Shrine to GW, my first realization that I was no longer in a decayed industrial corridor, came when the sidewalk turned from regular, old concrete to special brick walks. 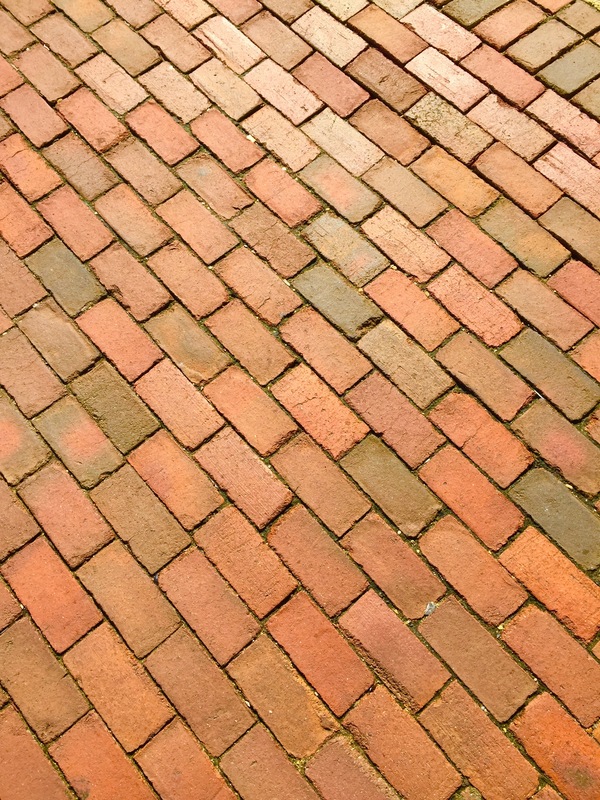 Although the walks were made of southern clay red brick and not yellow, it was clear that I was walking toward a historically curated town. The brick surface made my roller-overnight bag hop and jump as I walked. In another OZ comparison, my bag seemed animated, as if dancing down the yellow brick road to Alexandria. I wanted to walk to Gadsby’s Tavern, so I located it on my Google map app, and my New York walking shoes pushed on. There were a lot of cute retail stores, beautiful residences and attorney’s offices. Everyone was quite friendly and there were a lot of dogs. The afternoon progressed with my consulting and presentation efforts, and, following the evening public presentation, my “One Night Stand” at Gadsby’s Tavern began. My hosts were, from the start – fun and full of interesting facts and juicy gossip, and I was told that they had planned an entire evening of fun experiences. They also told me that they saw themselves as continuing in John Gadsby’s legacy– they were simply the keepers of the Tavern and Hotel. The first event of the evening was a dinner in the historically atmospheric, and beautifully appointed Tavern. The table was set with pewter plates, candles and linen appointments. Because it was often the drink of choice at the tavern, it was suggested that I order the rum punch to start off the evening– and I did. Ye Olde Menue read like a possible history text of conjectural, hypothetical yet marvelous food options. I chose the Gentleman’s PYE. 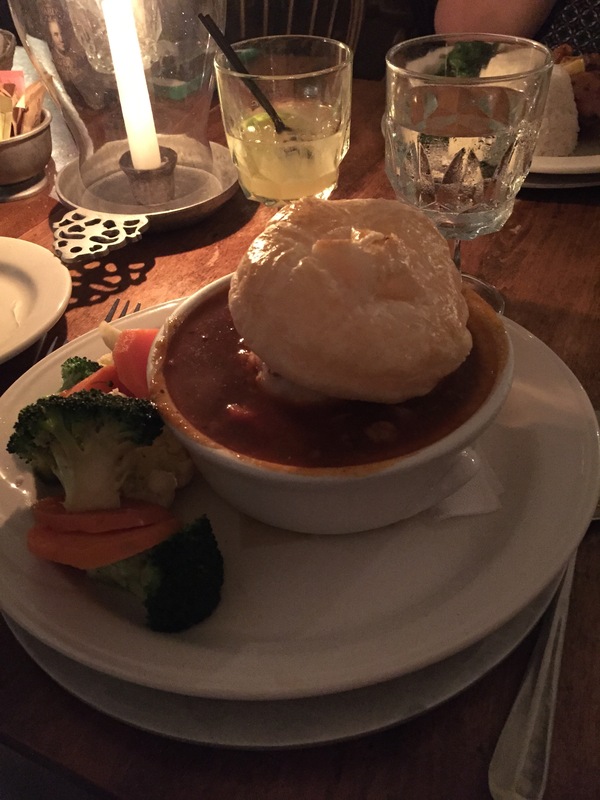 It was a kind’a meat stew with this big puff pastry thingy on top of it. It looked fancy. I was hungry. I drank my rum punch, ate my PYE and we chatted. It was a really pleasant dinner. Now, here is where I started to freak out. For those of you that know me, “period of interpretation” and dates matter less to me than the substance of the narrative. Don’t get me wrong, dates are important, but not in themselves. We discussed the complicated machinations of Gadsby’s Tavern, and later Hotel, and later & highly disputed (but interesting nonetheless) occasionally cited for activities associated with ill repute. This all was so complicated, that I pulled out my red pen and memo book, and tried to write it all down. Still not successful in gaining even the most marginal understanding of the timeline – I, out of frustration just asked them to either “put me in a bedroom that has a date that I can understand, or just pick a date and pretend that it is all “documented” from your archives”. We all laughed at ourselves and they happily agreed (we also had been drinking our rum punch, so that helped). But honestly, as I sit here now writing this “One Night Stand” blog post, I can’t for the life of me remember the year that I was supposed to tell you all for the “period of interpretation” of my lodging room. I think it was sometime between 1785 and 1800 (I had to check my little red notebook). Also, you must understand that there are two buildings, both with different dates of origin and different dates of leasing periods, with different ownership deeds. So there – I have done my due diligence to my fact checking readers. Let’s all just agree to not care from this point on in my post. 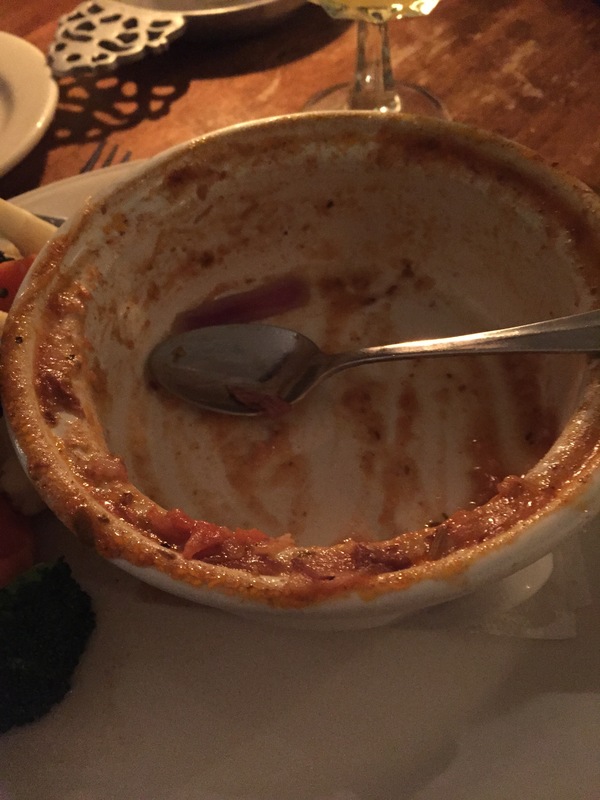 Even with all of this “period of interpretation” stuff going on – It was a grand dinner in Ye Olde Tavern. After dinner we headed to the lodging spaces. We wandered around a bit and chatted as I looked through the rooms and asked questions. They directed me to the basement and I followed. What I found was the staff room. It consisted of a really crowded, storage filled, space with a big community table at one end. There was a makeshift kitchen with a fridge. The table seemed to hold an element of detraction for all of the stuff surrounding it. In return, the stuff released any ownership of the space around the table and there was just enough room to grab a seat and relax. The truth is, that this is where the Colonial Oz analogy stopped, the “period of interpretation” was fuzzed, and the moment simply became about people chatting around a table. Effortlessly and without anyone directing, beers were pulled out of the fridge, a hamper of clean “COSTUMES” began to be folded, I checked my email, and the chit-chat started flowing. Laughter and a generous amount of real hospitality filled the tight space around the table. 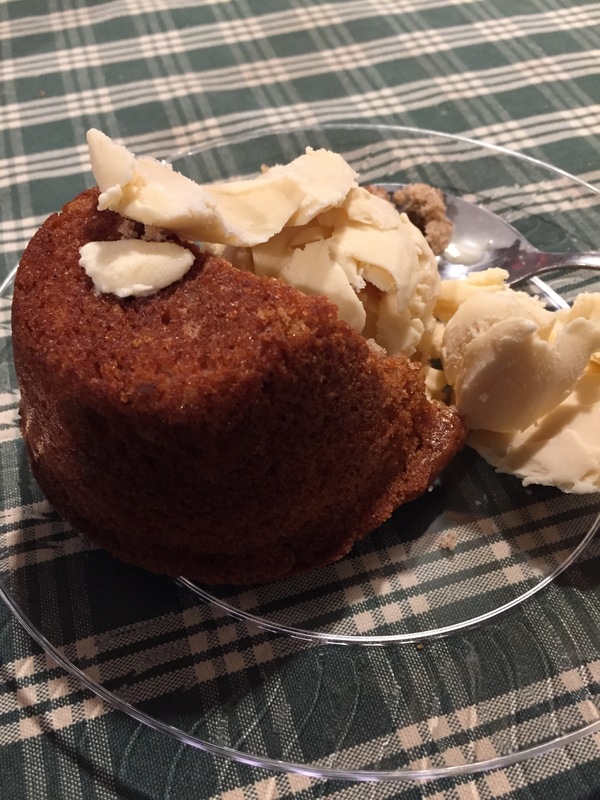 My hosts had ordered some gingerbread dessert from the Tavern “to-go” so we opened the Styrofoam containers while others grabbed spoons. To my surprise, a big tub O’ something was pulled out of a freezer and they began to cover the gingerbread with what looked like ice cream. I was into it and asked why the huge tub O’ Ice cream? They told me that the ice cream was left-over from an event. What was great about the ice cream was that it was BEER-ICE CREAM; That flavor was neither an historic recipe nor anything I had personally eaten before! The evening just kept getting better and better. The table was not set up in any pretty way. In fact it still had crumbs on it from previous gatherings. There was nothing curated or special about any of this environment. We sat, eating our ginger bread and beer ice cream for well over an hour. 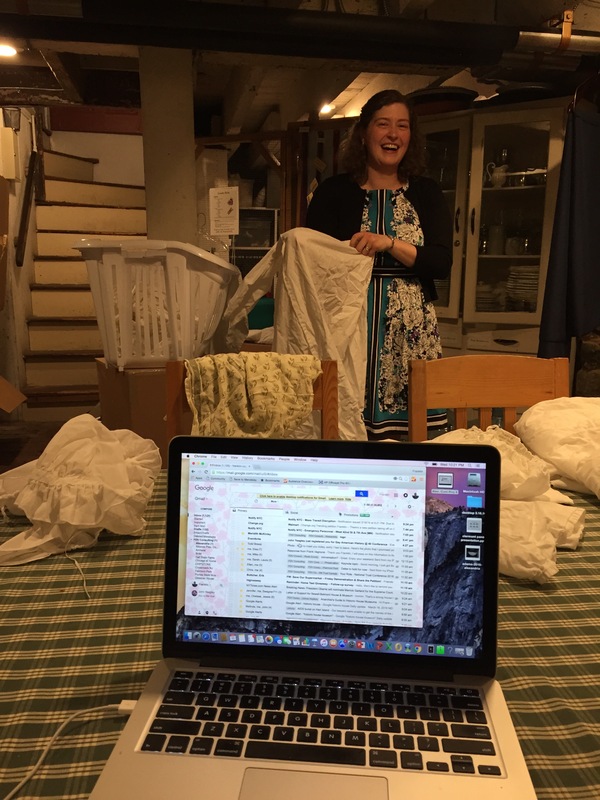 We discussed Bernie; Hillary & Trump, slavery, the difference between a “dealer” and a “user”, COSTUMES vs. clothing, my travels around the country and what other historic sites were doing, allergies to wool dresses, our families; kids; and pets. Without trying, we all just fell into a natural, intimate experience that I seriously suspect is quite indicative of how it must have been historically for a New York City Traveler arriving to Alexandria in the 17-somethings. As a traveler, not only were you hungry and tired, but you were also in need of conversation. You wanted to share news, hear about their town, discuss what was going on in the colonies or the new nation, and just plain gossip. I imagine these discussions were current, relevant and immediate. I suspect that they were full of anxiety, companionship, intimacy, and, of course, leftovers from the previous day’s meals. 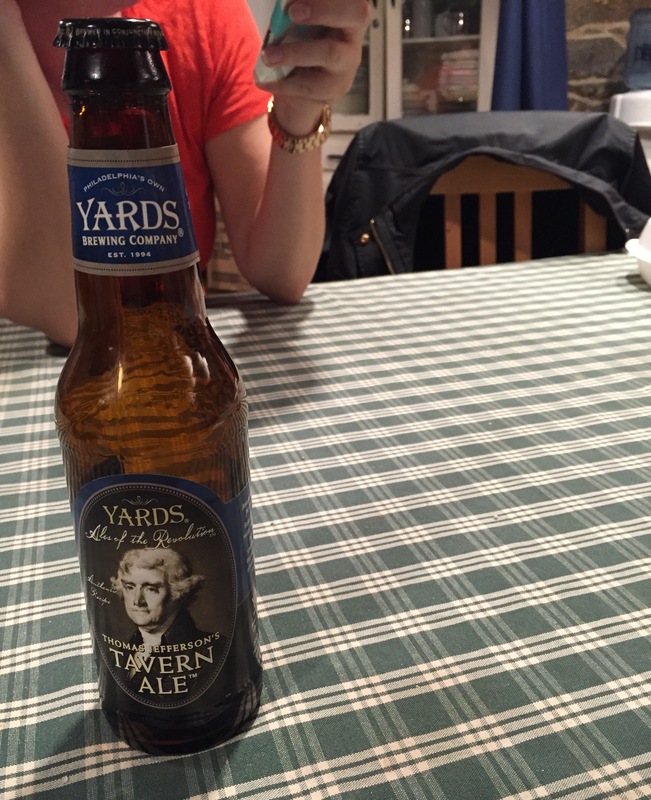 The authentic Gadsby’s Tavern was to be found in the basement, not in their period rooms upstairs. I loved my leftover dessert, the conversation, and the people. Gadsby was smiling. I told them that it was past my bedtime. We climbed the winder stairs to the third floor. It got much darker as you stepped up. I was imagining this being the end of a very long journey and how these contorted stairs would feel like an obstacle course for the traveler’s tired feet. 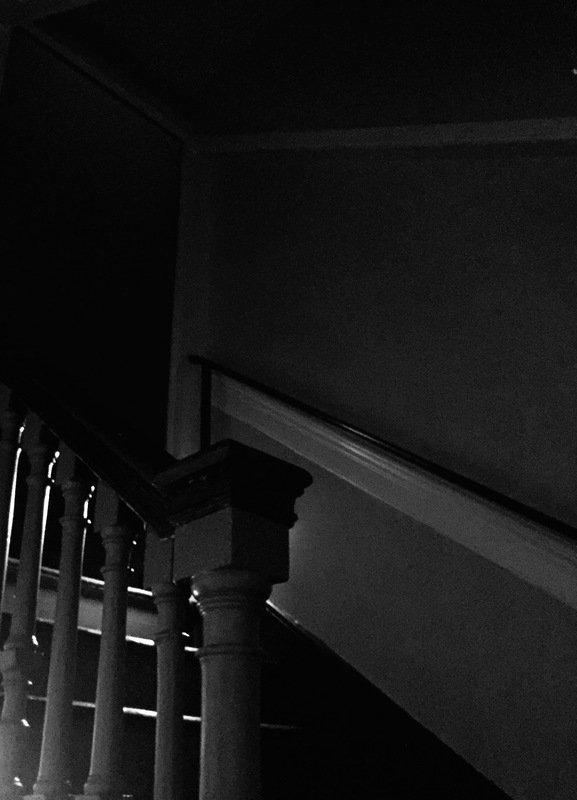 It was really dark in the dormer rooms. 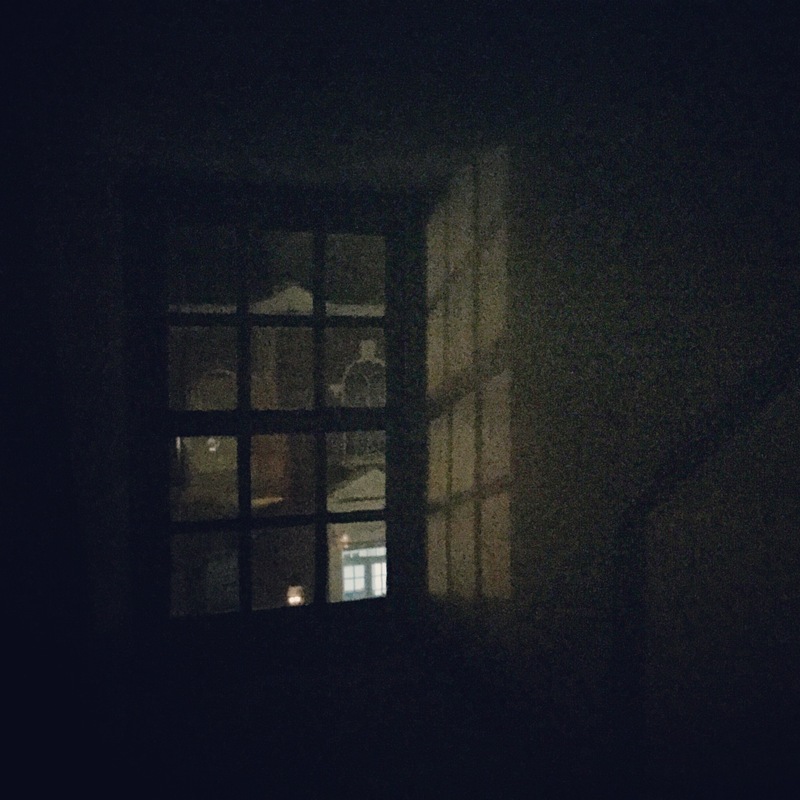 The only light came from an illuminated distant city hall steeple through one of the dormers. We were going to try and have me sleep on the rope bed, but the ropes needed re-roping, and we had too much rum punch and beer, so we just said to-hell-with-it and used the floor pads. We were tired and it was dark. We haphazardly gathered sheets and blankets and pillows from anywhere we could find them, set up the pads and got changed for sleep. 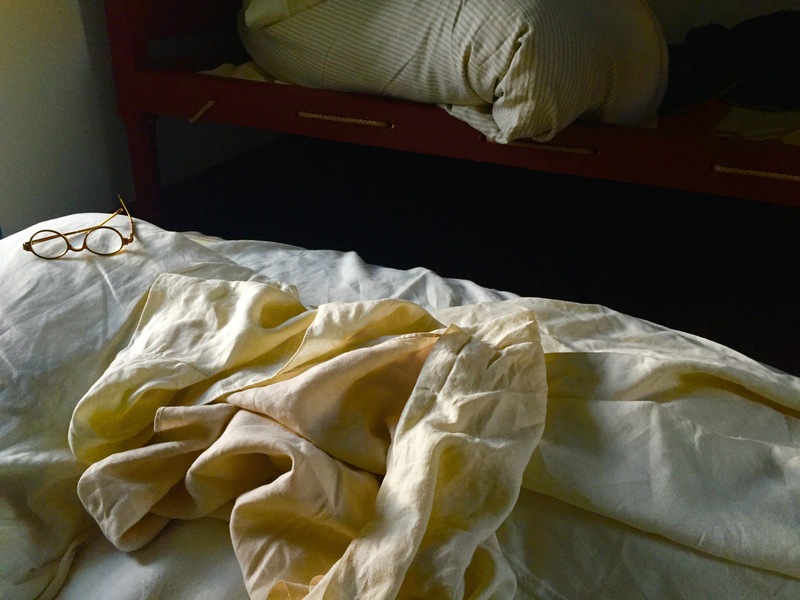 One of the distinctive things about this particular “One Night Stand” was that I was not sleeping alone. I had a handful of “stranger-friends” sleeping with me. 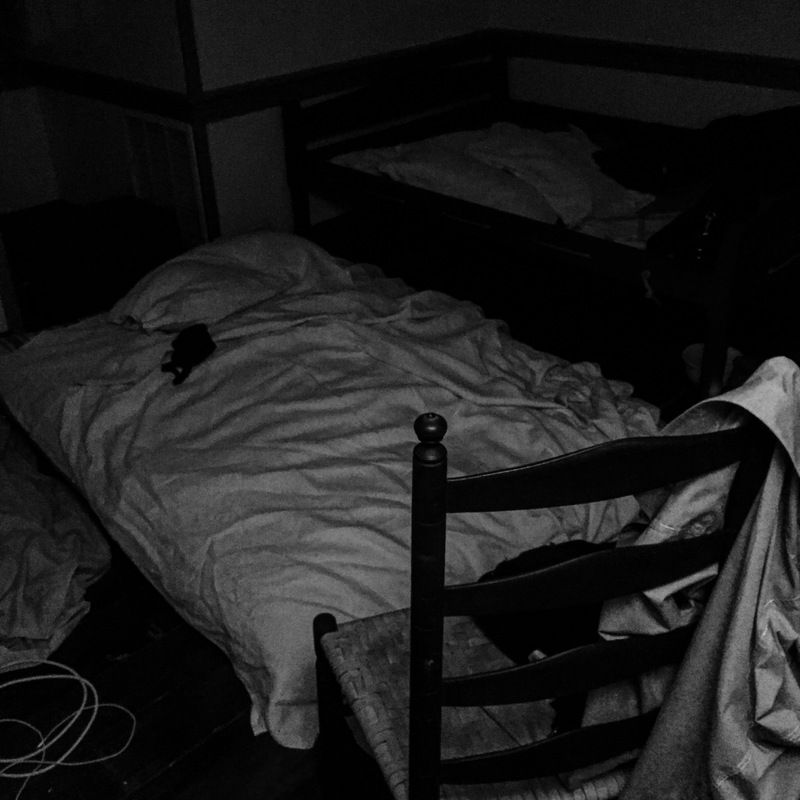 It would have been very common to have the lodging spaces full of multiple travelers, sleeping several to a bed and on hay-stuffed pads on the floor. The reason for this was that, by law, if an establishment wanted to sell alcohol, the also were required to offer lodgings. Although the lodgings were a regulated necessity, they did not have to be fancy. For this reason, I was sharing the dormer lodging space with “Rob”. I put his name in quotations because I want to keep his anonymity – and “Rob” seems like a generic name that you would chose. But, the truth is that “Rob’s” name was actually “Rob”. Now, I didn’t know Rob, but he seemed like a cool guy. 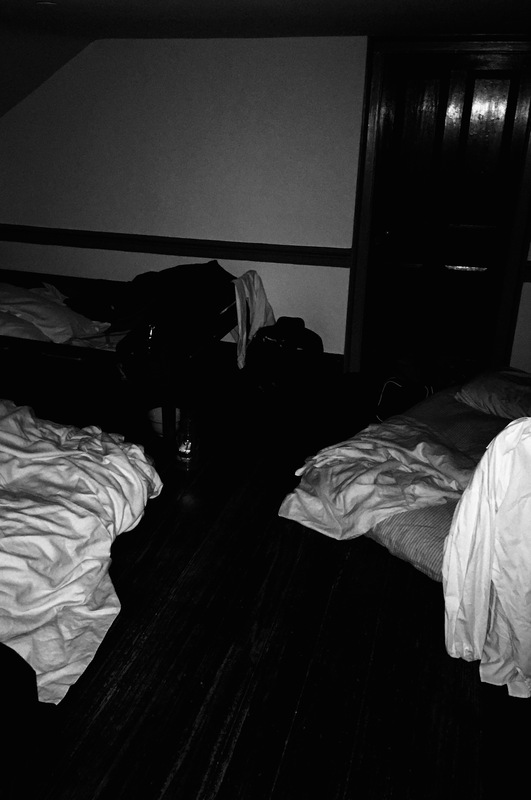 It was not required by my hosts that we share a rope bed, although historically that would have been expected, so they gave us each our own filled mattress to sleep directly on the wood floor. The room was chilly, but still comfortable. 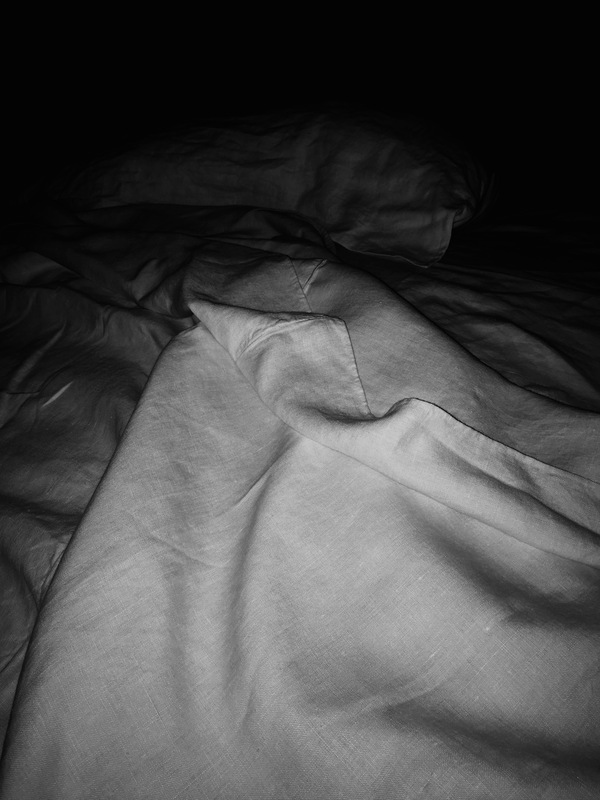 I just pulled two linen sheets from the neighboring bed, placed them over me and I feel right to sleep. So did “Rob”. I knew this because he started snoring almost immediately. It was in an odd way comforting to have the shared humanity of this stranger “Rob” snoring. I was given a chamber pot for the evening’s sleep, but I chose to make my way down to the staff bathroom. If I were alone, I would have used the pot, but I didn’t want to put poor stranger “Rob” through that uncomfortable humiliation. Imagine trying to wake up the next day after our group’s “one night stand” and having to pretend that you didn’t just hear me piss into a bowl. I saved him that humiliation. Like Dorothy, I woke up to a room that was transformed from the appearance of being a very dark, small closet, to a full on, brightly illuminated & colored space. The dormers were oriented east to west – so the morning sun streamed directly into the spaces. Oddly, I noticed, that the sun also shone on the neighbor’s metal roof and windows and reflected back into the Gadsby’s Lodging room. I was seeing the effects of two suns! 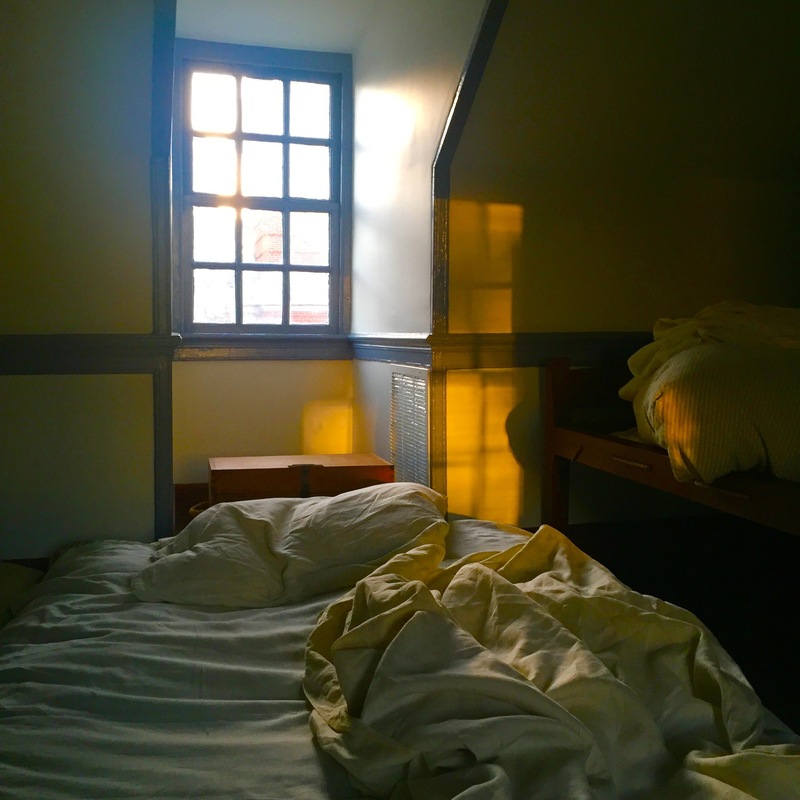 As I watched the sun rays making patterns on two opposing walls, my “One Night Stand” at the Gadsby’s Tavern and Hotel started to manifest into some clarity. The evening had been full of episodic conversations. Some of those parts were fact-based and even driven by dates and genealogy, while other parts of the experience were tactile, emotive and humanly intimate. 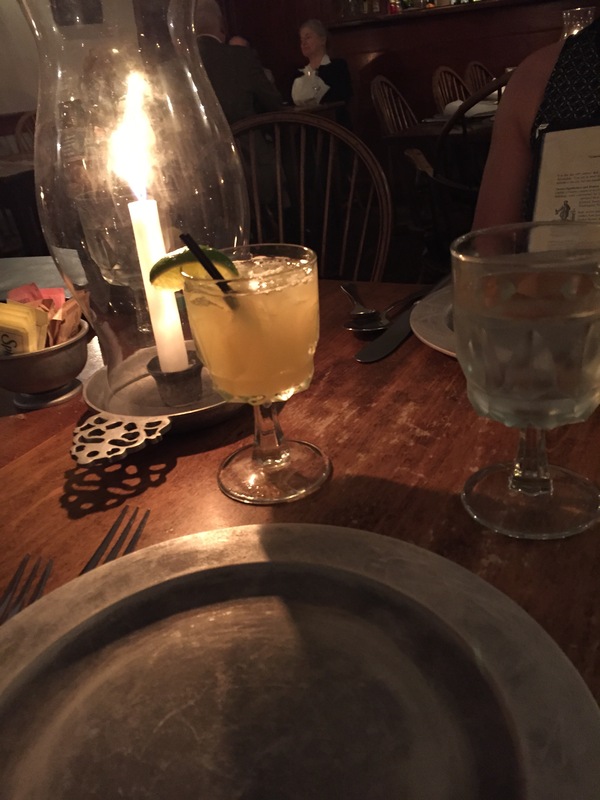 For me, the combination of these experiences fleshed out a Gadsby’s Tavern legacy. My new “one Night Stand” friends had done a fantastic job of making me, not only understand Gadsby’s legacy, but also feel Alexandrian hospitality. The third floor had sun coming from both sides – illuminating my experience from several perspectives. As I lay there on my stuffed pad waking up, it made me think of the quote from Emerson, “The rays that stream through the shutters will not be remembered when the shutters are wholly removed”. That is kind of the way I feel about the intimate lives of those who occupied these fragile sites – when we remove all of their humanity, we have only facts, dates, Alexandria chairs, blue & white bowls and documented periods of interpretation – what are we remembering? What’s left? 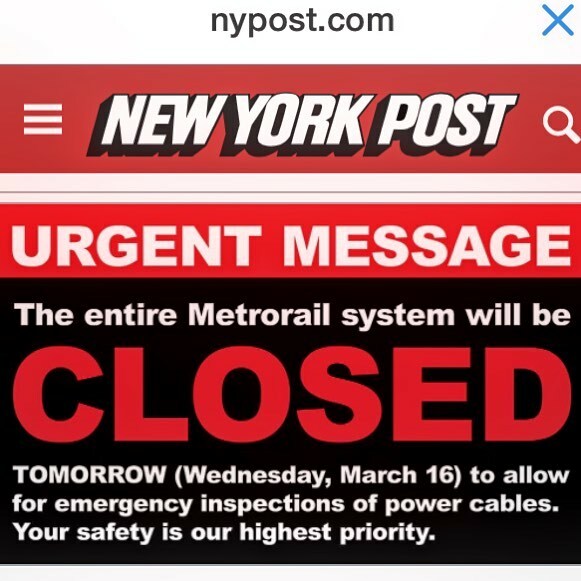 As I boarded the train back to New York City, “Rob” sent me a tweet. It read, “I survived the 1785 (1792?, 1802?) Night”. I “liked” his tweet. At least I know I am not the only one who couldn’t keep the damn dates straight. Hooray to you for picking Gadsby’s, a wonderful historic house museum. Hoorary to the brilliant staff for getting you to do this. And hooray to Rob who must have surely shown you the long route to the bathroom (1792? 1802? 1976?). Heck, I feel like that right now, and it’s not the 18th century nor am I traveling. Perhaps it’s an aspect of what Walker Percy called the distinctive mode of modern life, the sense that you’re always passing through experiences instead of inhabiting them. He savored them that way.